sa80 cleaning kit. Condition is Used. Quick field kit emergency clean with threaded pull through cable ! Oil bottle brushes m what you se is what you get Plastic cup with sniper tape applied waterproof! For in sack when in water situation with rifle ! 2 para kit ex used in theatre ! 100% positive feedback check out my other items . Small UK made Mod Spec. 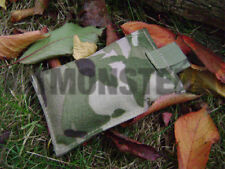 Cordura pouch in MTP camouflage. Kit Monster Exclusive 'Pocket Pouch'. Other suggested uses are a model kit carrier, battery bag or compass pouch. We originally had these produced as pocket or webbing pouches for broken down cleaning kits. 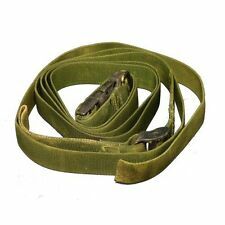 Original issue olive green British Army three point SA80 sling. Made of tough cordura nylon, the three point sling is best designed for the SA80 and M4. Rear of sling is looped to allow for the rifle to be hung when not in use. BRITISH ARMY ISSUE SA80 CLEANING KIT, COMPACT VERSION, FIELD POUCH. NEW. 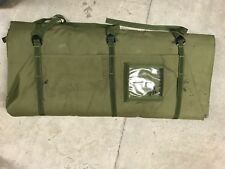 British army issue SA80 cleaning kit, this is the compact version, field pouch, designed to fit in a osprey pouch or similiar molle pouches, kit is in new condition, and is complete, plenty of flannelette and scotchbrite, swab is washable unlike the older lollipop stick swabs. Genuine British issue SA80 cleaning kit. DESIGNED TO LOAD YOUR NATO STANDARD MAGAZINE. IT IS BUILT TO BE NON-SLIP IN WET WEATHER CONDITIONS INCLUDING NON-SLIP FROM HAND PERSPIRATION IN HOT CLIMATES. In a used condition. Comes with the tool roll, combination tool and barrel dust cover. SA80 cleaning kit. Includes - flannette, pull through, combi tool, 2 brushes, scotchbrite, empty oil bottle and pouch. Original issue cleaning kit tool roll for the SA80 etc. British army surplus. SUPPLIED WITH THE TOOLS ILLUSTRATED. Army Surplus Clothing. We do in addition frequently have available a range of Helpful links. British Army SA80 Rifle Sling in Tan. Condition is New. Dispatched with Royal Mail 2nd Class. 4 x BRITISH ARMY OSPREY MKIV SA80 2 MAG POUCH. Marked on reverse - "OSPREY MKIV (MTP) - POUCH, AMMUNITION SA80 2/MAG - NSN: N.I.V. - DC4/4062". GENUINE ISSUE - MTP. 2 Molle tabs on reverse, with press-stud closure, to attach to base layer. BRITISH ARMY SA80 / SMALL ARMS CLEANING KIT MTP POUCH NSN 1005-99-232-3409 Please note no tools are included, this is for the pocuh only Current Issue New without bag, may have slight storage marks. ITEM HAS BEEN USED BUT IN WORKING ORDER.